Chihuahua Wood Smoked Salt is a wonderful and easy way to create a smoked flavor without a smoker. This particular spice was purchased at HEB, a Texas-based grocery chain. It is found in their bulk food/spice section. If you can’t find this smoked salt, try using a different one from your spice isle or bulk section. The dry rub along with the beer and juices from the ribs will create a very flavorful sauce to pour over the ribs once cooked. This is a great laid back Sunday meal, that doesn’t take a lot of effort but does take time in that the pork needs to marinate and is cooked low and slow for about 3 hours. Make this for at your next weekend get together and you will have plenty of time to “chat” with your guests! Serves four to six people. 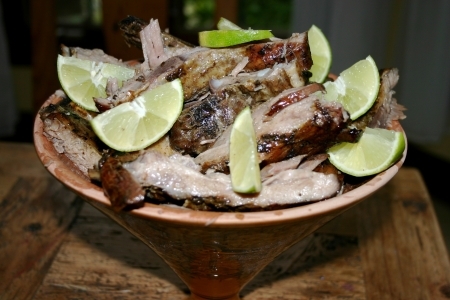 In a small bowl combine the oil, smoked salt and the lime juice. Whisk together until well combined. In a large ziplock bag combine add the oil mixture and the ribs and close the bag. Gently massage the ribs until evenly coated. Refrigerate and marinate for at least 6 hours or overnight. Once ready to bake, remove ribs and place into a large deep baking dish or cake pan. Pour the two beers into the baking dish/pan until ribs are completely covered. Cover with foil and bake at in a preheated oven at 325 degrees for about 3 hours or until ribs are almost falling away from the bone. Let rest for about 25 minutes or so. Cut into individual ribs, placing them into a large serving dish. Top with any remaining juices from pan and garnish with lime wedges if using. Charro Beans, Corn, Black Bean and Cherry Tomato Salad, or Fiesta Rice. Try our Classic Margarita, Cuba Libre or a Mexican beer – Modelo especial, Dos Equies or a Corona with a wedge of lime.